Everybody needs a night to decompress after a long week of work, and a few drinks just might do the trick. Unfortunately, the morning after can be quite rough, but there is a simple solution. 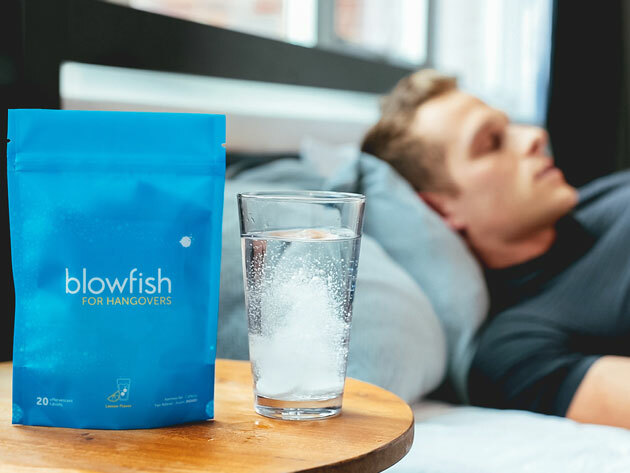 Blowfish for Hangovers is the FDA-recognized hangover fix that will have you up and running in no time! Backed by science, Blowfish for Hangovers provides a guaranteed method to help you beat the rough morning after a night of drinking. This magical tablet contains medicine specifically formulated to help cure your hangover symptoms. Say goodbye to rough mornings in just two tasty lemon tablets. Blowfish for Hangovers is very simple to use. Just drop the lemon-flavored tablets in a glass of water and wait for the fizzing to stop. Enjoy your tasty beverage and feel revitalized in about 15 minutes. Each package contains 20 doses. Don’t let hangovers get the best of you after a night of drinking. All you need is Blowfish for Hangovers, which is currently 20% off the original price. The Daily Caller readers can get this amazing hangover fix for just $19.99!